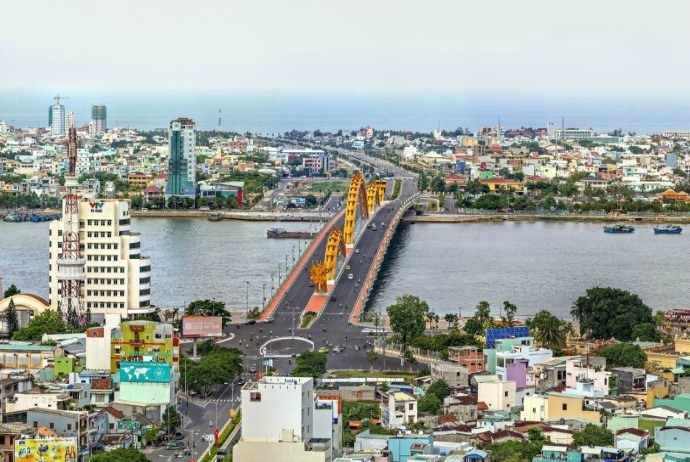 Aside from the modern buildings which are continually inaugurated, Da Nang (Đà Nẵng) also makes tourists “alluring” by friendly services, close Quang (Quảng) people, and simple things – all of those impressing deeply those people who come to this worth-living city. It is said that every tourist coming to Da Nang always wants to “check-in”. 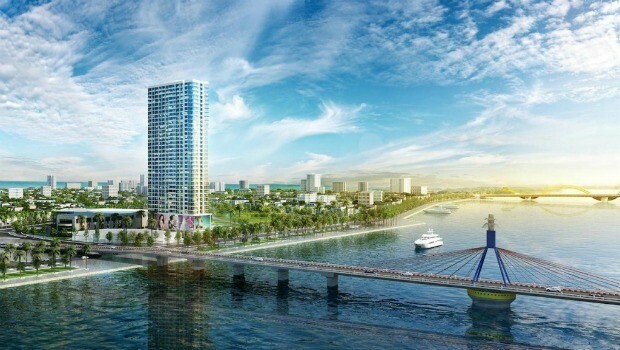 So, what is the reason behind that and why is Danang called a worth-living city? New York Times magazine polls Da Nang one of the ideal destinations in the world in 2015 because this place possesses the stretch of gorgeous sandy beaches. Besides, this city also clings to tourists’ feet by the modern and civilized image, and always offers something new. 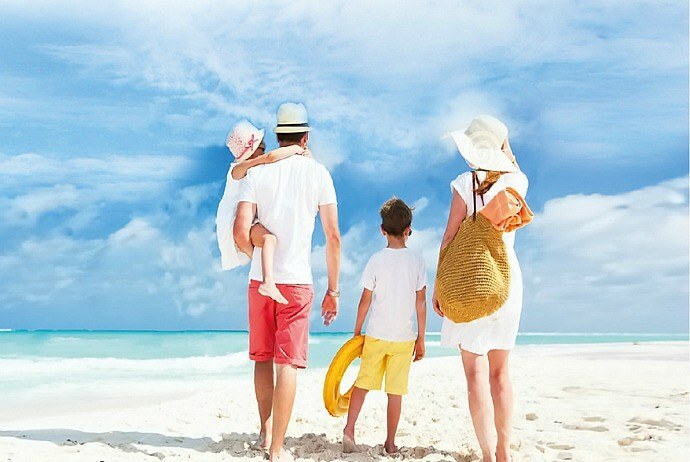 Visiting Danang, you will be able to enjoy the most charming beach on the planet, aside from mountains and passes, and luxurious resorts, but you will still not feel like being in a popular tourist destination which is crowded, triggering the fear of being “rip off” at anytime and anywhere. It is easily understood because local people in Danang do not consider this city as a place for “pickpocketing” tourists. For them, this is simply a beloved city – the pride of every person, and they love it dearly to such an extent that they always want to keep the best image about Danang in the heart of everyone who ever sets their feet here. 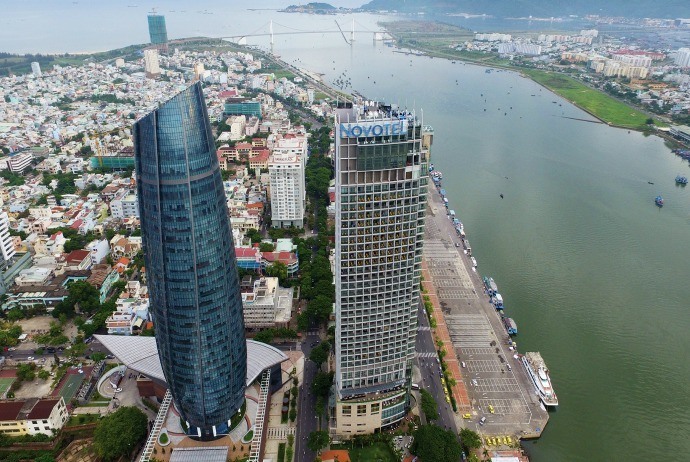 This article will list down 14 reasons why Danang is called a “worth-living” city. Take a look! Da Nang always possesses something that can create a certain “fever”. This is about new interesting projects appearing continually but still making people remembering. 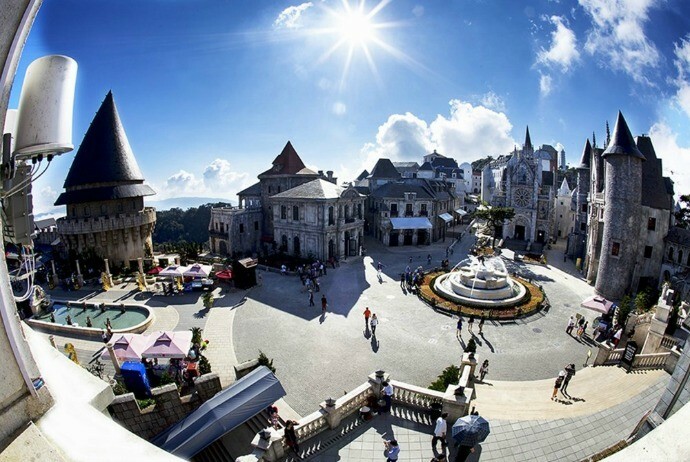 It is about Ba Na (Bà Nà) – the modern tourist resort with balmy climate, about the monumental Dragon Bridge which can breathe fire and water, about Sun Wheel or simply about the modern service-oriented A La Cart Hotel. Recently, people enjoy the image of carp turning dragon weighing nearly 200 tons which has been installed on the eastern bank of Han (Hàn) River, located between the Dragon Bridge and Han River Bridge. This image does not only have the meaning in terms of aesthetic but also become the symbol of bold art and folk belief with the image of the carp overcoming all difficulties to turn into the dragon. After the statue of “Carp into Dragon” was inaugurated, a “jetty of love” was also built in the Han River’s bank. The bridge with cute locks on the banister becomes an interesting and romantic place for couples. The bridge of love is not too strange abroad but this is the first time this unique work appears in Vietnam. Visiting Da Nang, tourists do not have to spend much effort or time to visit the nearby famous tourists attractions. They can ride the bike to head to Hoi An, or can take the bus to go to Lang Co for sightseeing, or go straight ahead to Hue to enjoy the taste of an ancient capital. The distance from Danang to My Son (Mỹ Sơn) Sanctuary is not far that allows you to depart almost right instantly. For those tourists who love the feelings of adventure, driving the motorbike on the Hai Van (Hải Vân) Pass will surely be an ecstatic experience because the spectacular, majestic of Vietnam will appear to the fullest when you drive across this pass. If Hue (Huế) and Hoi An always make tourists reminiscent because of the image of an ancient capital, Danang, on the other hand, triggers the feeling of wanting coming back because of the civilization and modernity and “transformation” after each visit. The stunning coastal paths also make tourists extremely excited. The resorts are in close proximity to one another, creating very gorgeous but poetic scenery. You should rend a motorbike to go if you want to enjoy all the sea breeze, just as liberal as the vitality of the Central area of Vietnam. 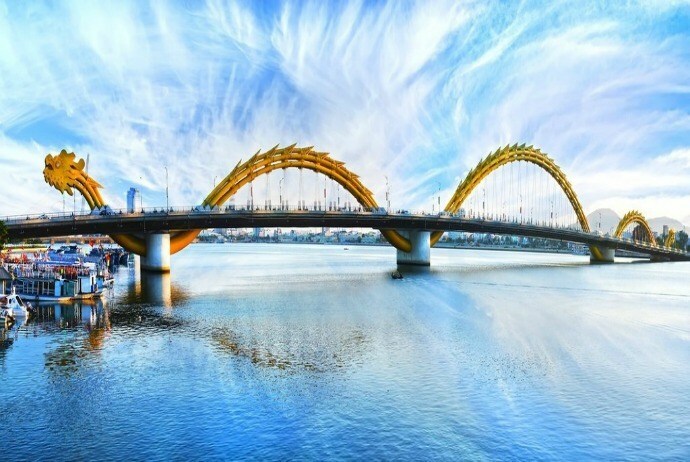 Being one of the most impressive bridges in the world, Dragon Bridge of Da Nang, Vietnam, honored by the modern beauty and the impressive ability of breathing fire, sprinkling. 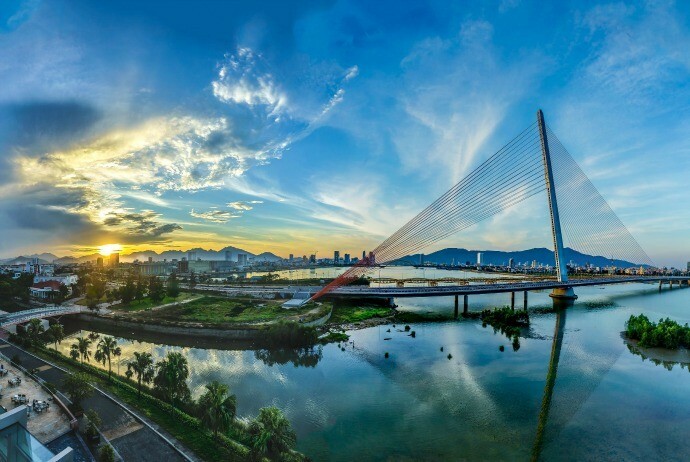 Opened to traffic in 2013, Dragon Bridge is the 7th bridge spanning the famous Han River of Danang City. With the unique architecture and the interesting performance offered, this bridge has been appreciated by many world-famous entertainment websites. This is the first time a project of Vietnam, made by a Vietnamese lighting designer, receiving the award of IALD in the history of 31 years of the oldest award in the industry, which is considered equivalent to an Oscar in cinematography or Pritzker in the architecture field. Many people compare Ba Na as “Da Lat” (Đà Lạt) of the Central. Just about 25km from Da Nang, the weather in Ba Na is cold all year round, even on the cloudy day, the whole Ba Na is covered with a white color like the fog. Here, strolling beside the clouds becomes a very normal thing. The thing that makes people love this land of sun and wind is obviously people here. When arriving in Da Nang, Quang (Quảng) people will give you the first gift – the smile. No matter where you come from, what your job is, they are still attentive and enthusiastic when you want to ask for directions, hotel address, and even some drivers, cycle riders will design the tour for first-time tourists. They will also enthusiastically advise you the addresses of the restaurants which are cheap and delicious, what means you should use to travel a certain tourist attraction, the amount of time you have to spend to get a specific place… In general, coming to Danang, you will never be afraid of opening your mouth to ask and will be responded with as-much-as-possible enthusiasm of local people. Even, you will want to talk more and more with them, because their voice and talking way are very interesting. Mr. Nguyen Ngoc Giau (Nguyễn Ngọc Giàu), a cyclo rider, is very proud when introducing about Danang – about the enthusiasm, friendliness of people here. That pride and love lie in the veins of each citizen of the city, from the vendor to taxi drivers, pedicab, newspaper sellers, from the old to the youth,… When it comes to Danang, they could ramble all day long about the idyllic culture here, with the affectionate voice of the Central people. Even, they will tell you about their city until you get annoyed, because you know that then you still have to leave this wonderful place after a short trip. 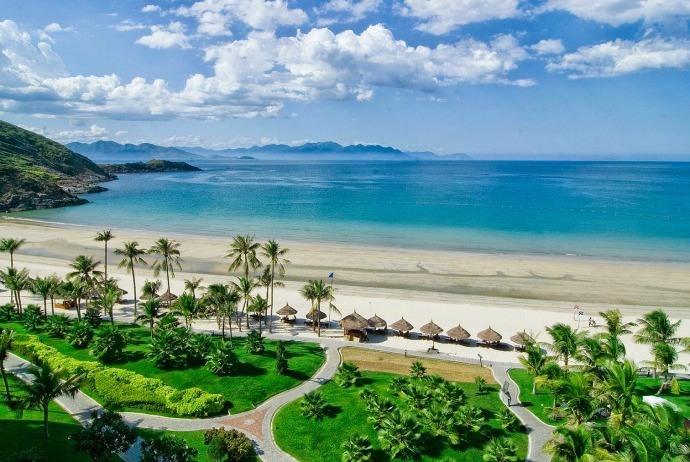 Being granted by the nature for the uninterrupted picturesque beaches, My Khe beach was praised as one of the most attractive beaches on the planet by the US economic magazine Forbes. Natural been granted in favor of uninterrupted beaches picturesque, My Khe beach so was the US economic magazine Forbes as one of the six most attractive beaches on the planet. My Khe beach has a length of about 900m, and is famous for its white sandy beaches, peaceful ocean waves, warm blue water all year round and dreamy coconut trees surrounding the beach. This is a beach which is even as peaceful, picturesque and romantic as those of paradises in Barbados or Hawaii. 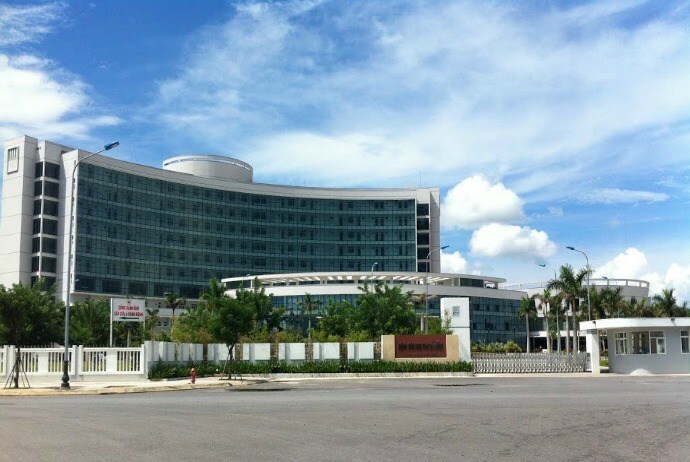 Many poor people from Da Nang or other central provinces have had the chance to receive free medical treatment at this extremely modern and spacious hospital. In terms of appearance, the hospital looks like a standard 5 start hotel rather than a hospital for the poor. Aside from the modern, luxury design with full of amenities like parks, boarding houses for the patients, clean canter…in 3 sessions of the day, free “affection” soup is given in the hospital. Due to this, people consider the Danang Cancer Hospital as the symbol of “love” and “humanity” of the city. You do not have to go to café shops for using wifi or miserably detect Wifi while sitting at the sidewalk noodle restaurant because since 10/07/2014, Danang offers officially free Wifi coverage throughout the downtown area in order to help residents as well as tourists connect internet stably . In Da Nang, you could use Wifi in every corner of the city. There is no other city in Vietnam having such type of special free service like this. Needless to say about how much Western tourists love Vietnamese food. In Hanoi, you can find noodles, rice vermicelli noodles; in Saigon, you can find rice paper cake, rice spaghetti, or “com tam”; but in Da Nang and Hoi An (Hội An), you can find a lot of things. 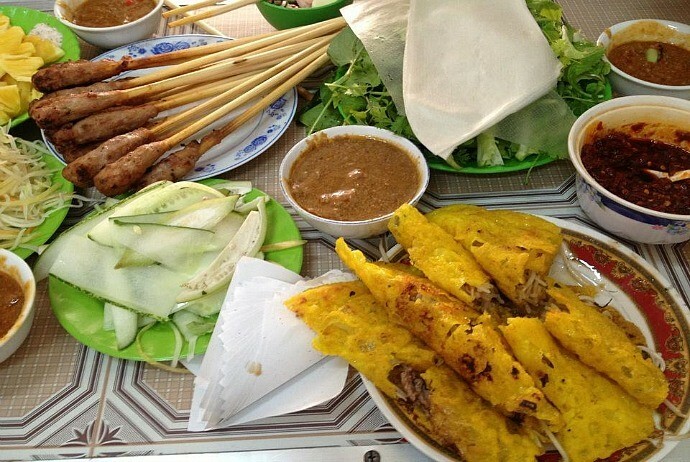 Really, Da Nang and Hoi An are considered as the miniature paradise of gastronomy. In Da Nang, tourists could eat from the smallest items like banh beo (bánh bèo), banh nam (bánh nậm) with just a few thousands VND/piece, to the delicious bowl of sauce noodles, fragrant baked meat and rice noodles with just from 15,000 – 20,000 VND; or the bread loaf containing salted shredded meat sold along streets. About seafood, it is very fresh and delicious here. Fresh seafood is caught from the sea and processed according to the bold taste of local people. After eating, when you charge money for your dishes, you will be surprised at how cheap they could be. All just cost about a few hundred thousands of Vietnam Dong (Việt Nam Đồng). Maybe, because of this, some people may just want to move into Da Nang to live and enjoy delicious dishes every day. It was rather familiar for us to see the images of beaches having full of rubbish, including bottles and snack covers… which are thrown around the white sand. However, in Da Nang, it is a different story. Whether it is weekend or public holiday with tourists crowded the beach, this beach is still clean without garbage, crab shell spreading far and wide like other beaches. It is because there are clear rules that do not allow canvas camping, dinning on the sand. The beach comes back to its true sense, just for people to visit, swim and strolling around only. Along the beach, there are penguin-shaped recycle bins reminding tourists to put trash into. Or, if there is someone unconscious, local people here will also remind or voluntarily put the garbage to put at the right places. Moreover, you know, looking at this beautiful white beach, how can anyone have the heart to throw a can down and then get the uncomfortable look from people around? In Danang International Airport, you can quickly forget the story of being gotten rip off for drinks and food because there is good food served here, but the price is much like sidewalk shops. Even, this city knows how to make us love it even when we are going to leave. Situated on Ong Ich Khiem (Ông Ích Khiêm) Street, between the central axis of Danang, Con Market is considered one of the main and the oldest market in Danang. 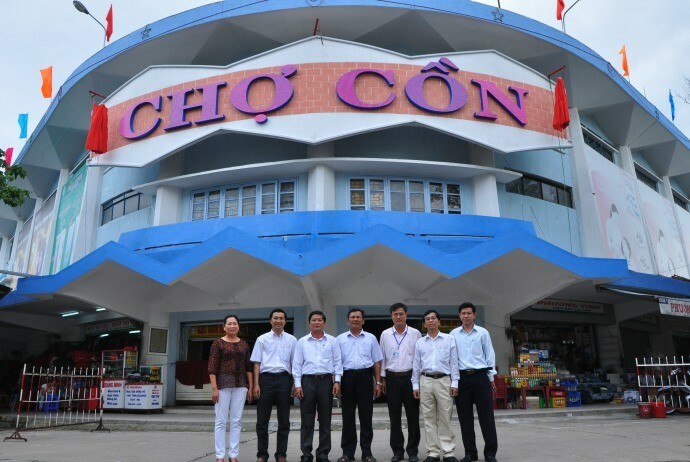 Built in 1940, because of lying on the high sandbank in the heart of the city, this market is called as Cho Con (Chợ Cồn). You know what? If you came to Con market already, then you should not be afraid to taste the food here. It is said that the most delicious food comes from the street, from bazaars of local people and Con Market is a place like that. We all know how uncomfortable it is when stepping into a public toilet. Even some people find a way to never have to set their foot in it. 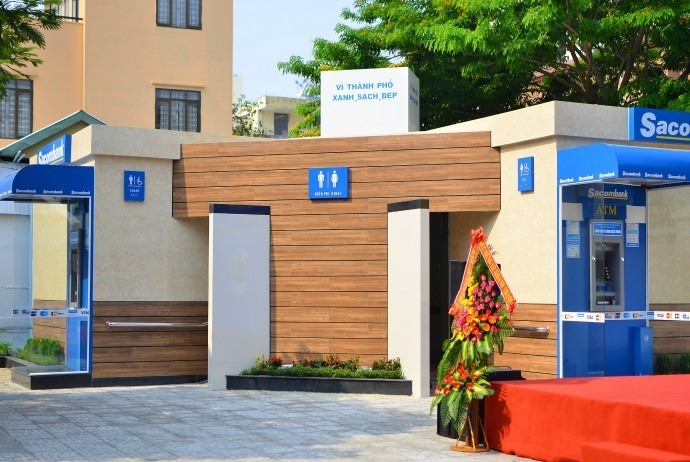 The investment in public toilets sounds not being able to offer any profit, yet in fact it brings lots of relief for tourists. And, in order to build a friendlier city to everybody, recently, the construction of public toilets having 5-star standards became a campaign which everybody is astonished and admired. Hai Chau (Hải Châu) Business Association and the center of Da Nang tourism promotion launched the program named “Comfort as home”, which means that at any place having this logo sticker, Danang people and tourists can use toilet without fee. 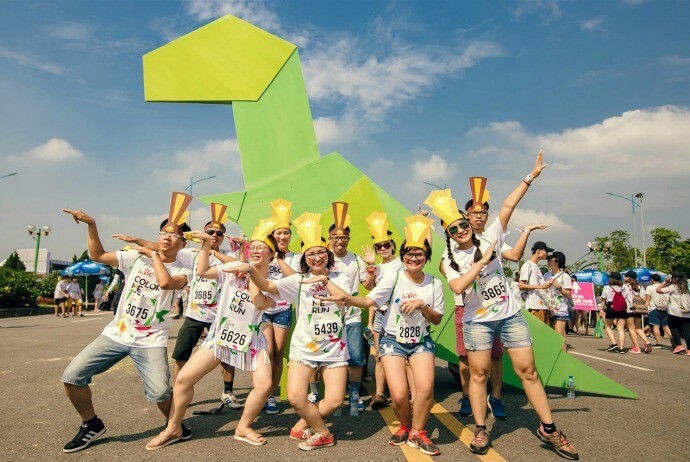 In one year, people can go to Da Nang once, but could also go twice or thrice because, in Da Nang, there are many fun and interesting events, be it monumental Fireworks festival or music festivals. Not to mention, the Iron Man competition has just been celebrated in Da Nang. The events or activities in Da Nang are very diverse and suitable for different objects, such as family or the youth or adventure enthusiasts – all of which create a not only beautiful but also very friendly and fun city like Da Nang.